Malaria Consortium Cambodia supports the National Malaria Programme to put in place effective and evidence-based malaria strategies. The office has offered a full range of perspectives including a programmatic approach (e.g. drug stock management) in relation to surveillance systems, and through long-standing support on design, implementation and analysis of large-scale surveys. Technical assistance has been provided for national malaria surveys every three years since 2004 to produce information that helps Cambodia track its progress in malaria control and rapidly respond to outbreaks. Malaria Consortium in Cambodia has also contributed to the development of a framework for containment of resistance to artemisinin combination therapies. Using a combination of technical expertise and local level knowledge, Malaria Consortium ensures an appropriate response to diagnosis and treatment in Cambodia’s uniquely dynamic drug environment. We provide support for village malaria workers across Pailin province, working with the Provincial Health Department to monitor their performance and strengthen their effectiveness. In addition, through our multi-country pneumonia project, funded by the Bill & Melinda Gates Foundation, we are working with ‘extended’ village malaria workers to test and evaluate the most accurate and acceptable tools to diagnose symptoms for pneumonia in young children in community healthcare settings. This trial will inform both national stakeholders in case management going forward as well as feed into WHO guidelines on best practice. Together with the National Malaria Programmes of Cambodia and Thailand, the World Health Organization and other partners, Malaria Consortium Cambodia is working to improve surveillance systems for the detection and follow-up of patients with delayed malaria parasite clearance. This initiative requires a cross-border strategy which Malaria Consortium has facilitated between governments. Malaria Consortium Cambodia excels in specialist operational research in both malaria and dengue. The office provides technical assistance and supports studies of vulnerable migrant and mobile populations’ knowledge, attitudes and practices and their access to diagnosis and treatment for malaria. We have screened households for asymptomatic malaria to help reduce transmission. We are also exploring the impact of innovative control methods on the incidence of dengue infection as well as find the most effective tool for pneumonia diagnosis in children in community healthcare settings. Malaria Consortium uses behaviour change communication in Cambodia to improve the prevention of malaria and dengue. This includes developing culturally appropriate information and materials and conducting evaluations on their use. The Cambodia office is also pioneering the use of positive deviance among vulnerable and hard-to-reach populations. Capacity building is fundamental to Malaria Consortium’s commitment to delivering long-term sustainability in our activities. 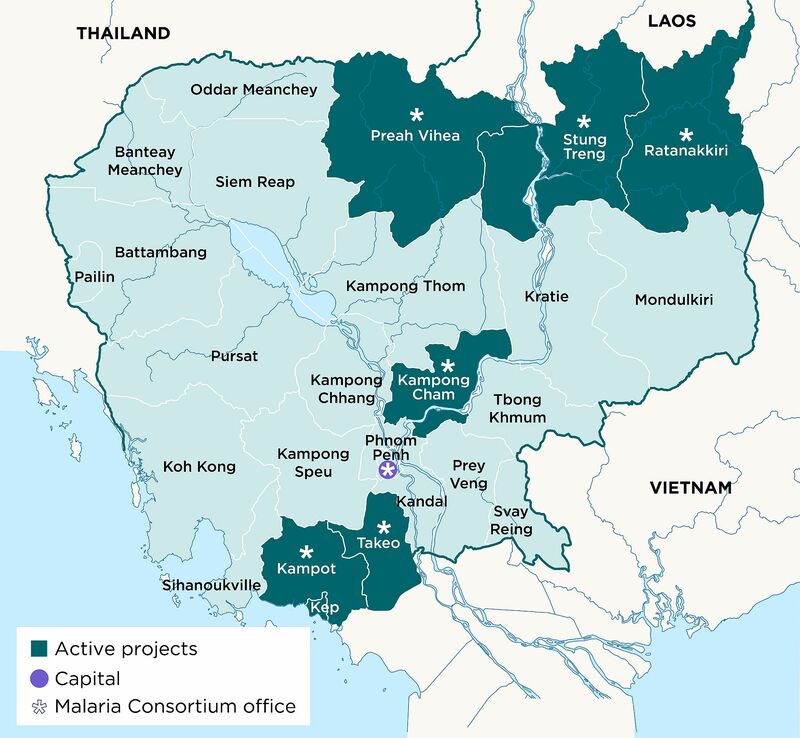 Malaria Consortium in Cambodia has assisted at both the provincial and national levels to strengthen the capacity of government officers, village health workers, mobile malaria workers and health volunteers. We also design training curricula on diagnosis and treatment, as well as deliver training to health staff.